Something that I have certainly seen to become more apparent in both my own life and many of those around me. It has always been there. From the Suffragettes, to Coco Chanel, to Gloria Steinem, to Oprah Winfrey, to Beyonce, to Emma Watson. Feminism is an ongoing movement that is and will always be forever growing. And I, having followed the movement and called myself a feminist for a while now, believe I am fully aware on my standpoint and felt I wanted to share them with you. Why? I guess because feminism can be a gulf people find hard to delve into and understand. Also, as with most things there are some negative connotations with the ideas. And although I am no expert I do wholeheartedly believe and support in this and want to give my part in bringing more people into it. My thoughts have always been there. I haven’t read something by Emma Watson or listened to a Beyonce song and suddenly calling myself a ‘feminist’, that’s not the case. I have simply found the community and the name of my beliefs. And it hasn’t been easy. Like many others, giving yourself such a name entails some scepticism from people. Not everyone is going to agree with you. Both in the feminism world and outside it. But that is something to overcome and build upon. Don’t let people get you down. More on that later. The photo above couldn’t sum up what being a feminist means to me better. Feminism is not just equality for women. It is equality for everyone – we’re all human. people misunderstand and believe it is a ‘no boys allowed’ girls club. But, as I once read and have never forgotten: ‘why question that it’s called feminism when the entire human race is called mankind.’ It is certainly not an exclusive club. Everyone is a part of this team and we work together. One for all and all for one! Now that is no stab at men. I truly believe equality for men is something that still needs a lot of work. Especially in the appearance department, just read a men’s magazine and it’ll most probably include some brand to wear, so many protein products and recipes you feel your muscles growing just by looking at it, and endless pictures of the ‘in’ hairstyles. And if that wasn’t enough, look at all the sporting, cars, mechanical and fitness magazines – well not just magazines, its all the TV shows and online articles and videos, and in a lot of groups of boys. This is something I hope to see a big change in soon, as I feel men are more quiet about being who they want to be. They just follow a bit like a sheep, well that’s what I have seen in people around me and online. Men, like women, should embrace who they are and what they like without being called a girl or being called gay or something. Which swiftly brings me on to another point. Being a girl, being gay, being black or white or Asian is not an insult. It is nothing to be offended by. Being a feminist to me is not just about bringing people together, it is a person building movement, teaching you to be you and love yourself. Enough said really. Next, a little sociology lesson for you all. I did sociology A level where you study feminism a lot, and that widened my knowledge so much. And there are some things you wouldn’t really know unless you actually studied the subject thoroughly. So I thought I’d try (emphasis on try) to explain a little bit and hopefully help some of those who find it hard to get into and understand feminism. I’ve heard many people say that feminism is against men, they see them as the enemy. To an extent they aren’t wrong. But it should be made clear that there are different types of feminism. What sceptics are referring to are ‘black feminists’. Where men’s use as sperm providers and other than that they don’t really have much use. But these feminists are of the minority. The type of feminist I call myself, and is probably the majority are ‘liberal feminists’ who, in a nutshell, believe in equality in everyone. Now, I am going to leave this post there for now. I really want to do more posts on feminism as it such a big part of my life and something I feel should constantly be preached. So before I write a novel I shall say goodbye. Hi! I’ve started a campaign to redefine ‘female’ as a positive word. Take Back the F Word is a social media campaign aimed at raising awareness of the importance of diminishing gender stereotypes. It aims to continue and expand on the conversation surrounding gender stereotypes in order to dissolve the negative connotations of female centric roles and vocabulary. 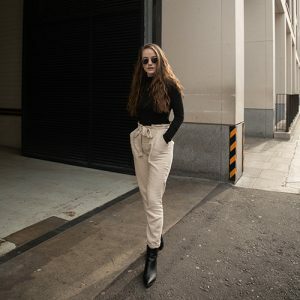 I would love to be involved in your blog, possibly for a collaboration? I have always loved reading your content, and i feel like it’s a wonderful source of female positivity! Have a look at my blog, and please let me know your thoughts. If you would like to discuss this further, please contact me on [email protected] or any of my social medias. This sounds like such a great idea, and an element that definitely needs to be covered. I’ll definitely have a look and get in contact as I’d love to get involved in some way!